create documents, spreadsheets, drawings and presentations. Sign in using your UCT email address and UCT password. You’ll be redirected to UCT’s Single Sign-on page. Sign In to the UCT Single Sign-On page using your UCT username and password. Click Apps and select the application that you would like to use. Not all of the G Suite for Education have been made available at UCT. This table shows what is available from your UCT account compared with what you can access from your personal Google account. Use this instant messaging functionality to communicate with students and staff at UCT. Google Hangouts is accessible on PCs, laptops as well as Apple and Android devices. This productivity suite is exclusive to Google Suite for Education subscribers and is aimed at providing a paperless solution for lecturers and students. 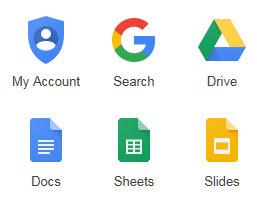 Lecturers can create folders in Google Drive for various assignments and allow students to submit their work online. Class notes and other relevant information can be shared via Google Docs and a schedule containing assignment due dates can be stored in a central location. Classroom is accessible online via a PC, laptop or mobile device. This applications is not covered by the enterprise agreement with Google and therefore is not supported. Use Google Sites to create a team or club website, or an intranet site for your department/faculty. UCT's approved email and calendaring solution is Microsoft Exchange and Office 365. This application is therefore not available on Google Suite for Education. Due to UCT using the Microsoft calendaring solution this service will not be available to campus. How do I use Google Apps? Use the Synergyse Training virtual guide which is aimed at helping users get the most out of their Google Apps experience and training them to be more productive. You can either follow the steps below or watch this updated video to access the training. Open Google Chrome and log on to your Google account using your UCT profile. Click the Google Apps grid and select the App you want to learn about. Click the Google Apps grid again and scroll down to More. Scroll down and select Synergyse Training for Google Apps . Select the App that you want to learn and select a lesson from the list that appears. To watch another video, either click Next or select from the available list. When watching the above courses, remember that UCT has not made the full suite available to staff and students. Will the information in my personal Google Drive show in the UCT-managed Google Drive? Is it mandatory to use the UCT managed Google Services or can I continue to log on with my personal email address? No. You can opt to use it or not. Will I have access to the UCT-managed Google services once I leave the University? Currently, this offering is not for life, so access will be revoked when you leave UCT. How much space is available on the UCT-managed Google Drive? At the moment it is 10TB, but this is under revision by Google.